Infant nurse Virginia Jaspers was much in demand in the upscale neighborhoods she served, the pricier suburbs to the west of Yale University, where new parents had both the space and the money to hire live-in help after the birth of a baby. Virginia was an unusual woman, the slow and outsized daughter of a local railroad executive. She stood six feet tall and weighed 220 pounds, with a mannish frame and large hands. As a child, she is reported to have responded with calm good nature when classmates taunted her with names like “horse” and “elephant.” As a private nurse, she was not known for her intelligence, but for the extravagant attention she lavished on infants in her care. Families seemed to like Virginia, the lonely but affable misfit who found her pleasures in babies, visitors, ice cream, and movies. One of her first charges, a little girl only 13 days old, had quit breathing while Virginia was on duty, but the death was attributed to birth defect, and the girl’s family, confident in their nurse’s abilities, hired Virginia again two years later when their son was born. The boy thrived, and the families stayed in touch afterwards with cards and photos. As the years went by, though, local doctors began to remove Virginia from their lists of certified pediatric nurses, as various of her charges were brought in with puzzling injuries. Dr. Robert Shapiro, uneasy about a broken leg in a patient not yet crawling, raised his fears quietly with colleagues, who had stories of their own. Still, Virginia kept working, her name passed by word of mouth from one parent to another. Then, at 2:30 am on August 23, 1956, Virginia called for help with 11-week-old Abbe Kapsinow. Virginia said she had awakened in the night and heard the girl breathing too heavily—Abbe died at the hospital two hours later. The doctors had had enough. They approached the coroner with their suspicions. Virginia freely admitted to police that she’d given Abbe “a good shaking” earlier in the evening, to “get the bubble up” when the girl refused her scheduled formula. At first she denied any use of extreme force, but she broke down under questioning, reportedly lamenting, “I don’t know why I did it. I ought to be put in the electric chair.” After Virginia’s arrest, horrified parents began coming forward with their own tales of unexplained injuries—Virginia Jaspers seems to have killed 3 children and tragically maimed at least 12 others in her 8 years as an infant nurse. As a serial-killer babysitter, Virginia Jaspers is a potent icon in child-abuse prevention—and she plays a unique role in the annals of Shaken Baby Syndrome. Her 15 presumed victims accounted for slightly more than half of the 27 cases cited by Dr. John Caffey in his groundbreaking article proposing baby-shaking as a mechanism of injuy. Published in the prestigious Journal of the American Medical Association (since renamed JAMA), the Kempe article, with its gripping title and its bold call to action, struck a national chord. The mainstream press ran with the story: magazine articles were published and television documentaries made. The Junior League adopted the cause and gathered signatures on petitions that convinced Congress to pass legislation. Physicians accepted responsibility for recognizing inflicted injury—and mandated-reporting laws soon specified their legal duties. Nurses, teachers, social workers, neighbors, all were enlisted to watch for the signs of child abuse: frequent bruising, patterned bruising, implausible explanations for obvious injuries. In northern England at that time, Guthkelch told me, shaking a child in the course of discipline, “or not even discipline, correction, shall we say,” was considered acceptable. He had treated infants with unexplained brain bleeds much like the bleeding seen in battered children, and had spoken with parents who included shaking in their description of events leading up to the child’s hospitalization. Reaching the obvious conclusion, he enlisted local health workers to teach parents not to shake their children, as it could be causing damage to developing brains. Caffey’s focus was the long-term damage of routine shaking. His worst fear was that mild but habitual shakings in the course of play and transport could be robbing children of normal brain development. “Some, perhaps many, of the cerebrovascular injuries which are currently attributed, both clinically and microscopically, to prenatal infections, congenital malformation, birth injuries, and genetic metabolic diseases are undoubtedly caused by undetected, depreciated, and inapparent whiplash-shakings during the first weeks and months of life,” he wrote. Caffey absolutely forbade parents from shaking children in the course of discipline and even warned against “overvigorous” burping. He advised against all rough play with babies and toddlers. He called for an examination of “toys and recreational contraptions which generate whiplash-shakes and jolts to the head,” including baby bouncers and infant jumpers, motorized cradles and rocking horses, and, for older children, swings, seesaws, slides, trampolines, and sleds. “The same studious consideration should be given to jolting transport-vehicles which carry infants and small children—bicycles and such powered vehicles as motorcycles and motorcars driven rapidly and habitually over rough roads,” he wrote. The proposition was quickly accepted, on both sides of the Atlantic, that infant shaking explained at least some of the mysterious subdural hematomas found occasionally in very young children. Ophthalmologists began studying eye damage in shaken infants, radiologists the medical imaging. Direct experimentation was unthinkable, of course, but practitioners tried to glean as much information as possible from the cases they saw. Teams of specialists pooled their expertise, drawn together by a shared compassion for their tiny patients and an intellectual fascination with the ways of the human body. 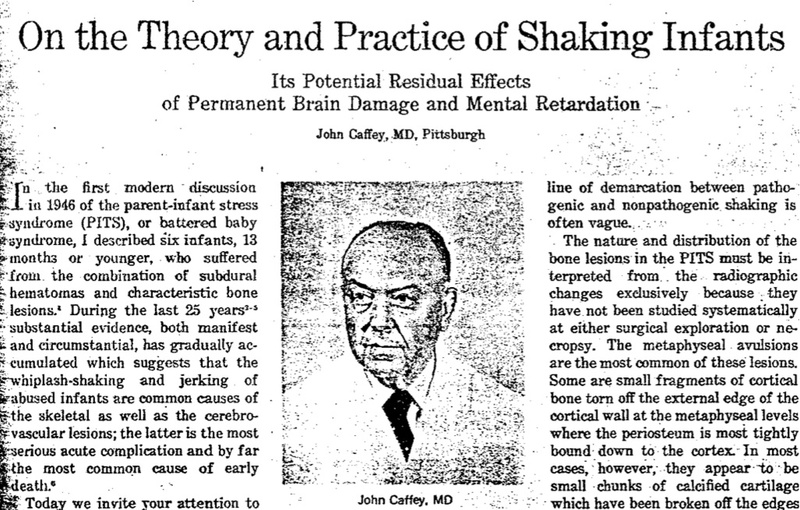 It wasn’t until 1987, fifteen years after the groundbreaking articles, that collaborators from neurosurgery and biomechanics at the University of Pennsylvania in Philadelphia published an astonishing paper that brought into question Caffey’s fundamental assumption: that shaking alone, in the absence of impact to the head, can cause the classic symptoms of Shaken Baby Syndrome. According to their calculations, the researchers said, a normal adult is not capable of creating the necessary forces. That paper triggered a debate that still rages, today hotter than ever. To see the next posted chapter, click here. Caffey J. “On the Theory and Practice of Shaking Infants,” Anerican Journal of the Diseases of Childhood 1972; 124:161-169. Peinkofer, J. “The Infant Nurse of East Haven: Virginia Jaspers’ Legacy 1948–1956,” presented at the Third National Conference on Shaken Baby Syndrome, Salt Lake City, 2000. Caffey J. “On the Theory and Practice of Shaking Infants,” American Journal of the Diseases of Childhood 1972; 124:161-169. Caffey, J., “The Parent-Infant Traumatic Stress Syndrome; (Caffey-Kempe Syndrome), (Battered Babe Syndrome),” American Journal of Roentgenology, Feb. 1972, 114:217-228. Caffey, J., “Multiple Fractures in the Long Bones of Infants Suffering from Chronic Subdural Hematoma,” American Journal of Roentgenology, Aug. 1946, 56:163-173. Silverman, F.N., “Unrecognized Trauma in Infants, the Battered Child Syndrome, and the Syndrome of Ambroise Tardieu” (Rigler Lecture), Radiology, August 1972, 104:337-353, 338. Guthkelch, AN “Infantile Subdural Hematoma and Its Relationship to Whiplash Injuries,” British Medical Journal, 1971;2:430–431. Caffey J. “On the Theory and Practice of Shaking Infants,” American Journal of the Diseases of Childhood, 1972; 124:161-169. Duhaime AC, Gennarelli TA, Thibault LE, Bruce DA, Margulies SS, Wiser R. “The shaken baby syndrome: a clinical, pathological, and biomechanical study,” Journal of Neurosurgery, 1987; 66:409-15.